If I were to rank all of today's comedians-turned-actors -- never mind who would be at the bottom -- I would put Jim Carrey, Michael Keaton, and Eddie Murphy near the top. But occupying the very top spot would have to be Bill Murray. In the last ten years, he has given us spectacular turns in "Quick Change" (1990), which he also co-directed, "Groundhog Day" (1993), "Mad Dog and Glory" (1993), "Ed Wood" (1994), "Kingpin" (1996), and "Wild Things" (1998). Before that, he popped up in potent bit parts in "Caddyshack" (1980), "Tootsie" (1982), and "Little Shop of Horrors" (1986), and laid it all on the line for his own pet project, "The Razor's Edge" (1984), which was unsuccessful, but interesting. 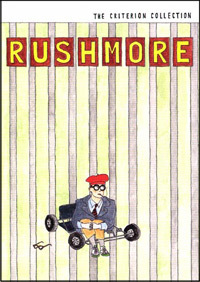 The main character in Rushmore is Max Fischer (Jason Schwartzman, the talented son of Talia Shire, nephew of Francis Ford Coppola, and cousin of Nicolas Cage), who is president or founder of nearly every kind of extra-curricular activity imaginable in his prestigious school, Rushmore Academy. Unfortunately, his grades are failing and he is on the verge of being kicked out. Max wants nothing more than to stay in Rushmore. Looking for help, he befriends a tycoon, Mr. Blume (Murray), and develops a crush on a British 2nd Grade teacher at the academy, Miss Cross (Olivia Williams). When Mr. Blume and Miss Cross fall in love, Max goes on the warpath to revenge. It's all a bit overwhelming, and the obsessed Max is sometimes hard to connect with until you embrace his eccentricity. Murray, on the other hand, delivers a strong sad-sack performance, and his long face tells volumes. He shines in every scene he's in -- locked out of his own car by his dimwit wrestling-team sons, hopelessly jumping in the pool during a big party at his house, coolly but hopefully accepting a carrot from Miss Cross, and at the end of his rope while getting a haircut from Max's dad (Seymour Cassell).